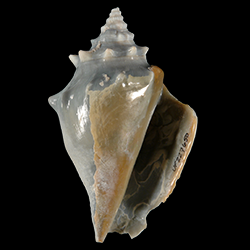 Key morphological features: The Strombidae are medium to large (to ~400 mm) sized gastropods with solid, angular, moderate to high-spired shells. 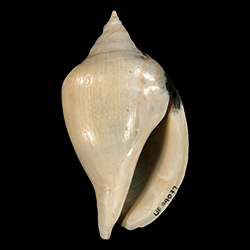 The shell exterior can be smooth but in many species features prominent knobs on the whorl shoulders. Spiral cords are also common, often widening towards the aperture, giving the shell lip a wringled appearance. The aperture in adults is flared, the degree of which is species dependent, but can be extensive, and can include thickening and/or long projections of shell outward from the lip. The posterior canal extends up the spire and in some species can extend far past the spire. The columella is callused and smooth, tapering to a rostrum anteriorly. The siphonal canal, if present, is short and is next to the rostrum. Strombids are also characterized by a notch in the anterior portion of the labrum called the stromboid notch that in living individuals serves as an opening for the extension of the right eye stalk. Source: Davies, A.M. 1971. Tertiary Faunas Vol. 1, second edition. New York: American Elsevier Publishing Company, Inc. 571 pp. ; Tunnell Jr., J.W., Andrews, J., Barrera, N.C., Moretzsohn, F. 2010. Encyclopedia of Texas Seashells. College Station: Texas A&M University Press. 512 pp. Geological range: Cretaceous to Recent (Davies, 1971). Geographic distribution: A distributional map for modern Strombidae may be accessed from OBIS. 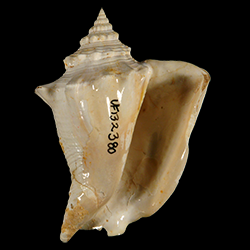 A distributional map for ancient Strombidae may be accessed from the Paleobiology Database. Diversity: There are 91 recognized living species of Strombidae and 23 genera (WoRMS database, unvetted). The Paleobiology Database recognizes 30 fossil genera and 379 fossil species of Strombidae (unvetted). 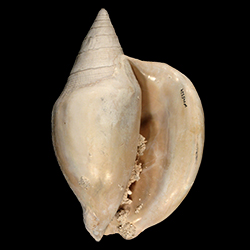 Paleoecology: The Strombidae are epifaunal, herbivorous, marine gastropods. They live in both soft substrate and hard substrate, warm water habitats, including sea grass beds and reefs. Source: Tunnell et al. (2010); Latiolais et al. (2006). Phylogenetic status: Monophyletic. Molecular phylogenetic studies of Strombidae have focused primarily either above or below the species level (e.g., Zou et al., 2011; Latiolais et al., 2006). However, a morphological phylogenetic analysis by Simone (2005) supports the monophyly of Family Strombidae. Reference: Simone, L.R.L. 2005. Comparative morphological study of representatives of the three families of Stromboidea and the Xenophoroidea (Mollusca, Caenogastropoda), with an assessment of their phylogeny. Arquivos de Zoologia, Museu de Zoologia da Universidade de São Paulo 37 (2): 141-267.